In loving memory of Rachel Young. 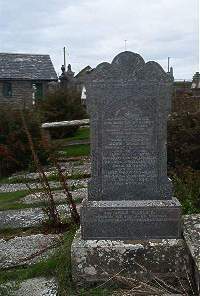 John Sinclair of Quoys Forse died 5th October 1921 aged 65. Eldest daughter Rachel Young died 7th November 1896 aged 5. Daughter Margaret Campbell died 14th March 1928 aged 33. Son Robert Finlayson Sinclair died in Japanese hands Borneo 1942 aged 47. Wife Annie Sinclair died at Latheron West 16th July 1945 aged 83.